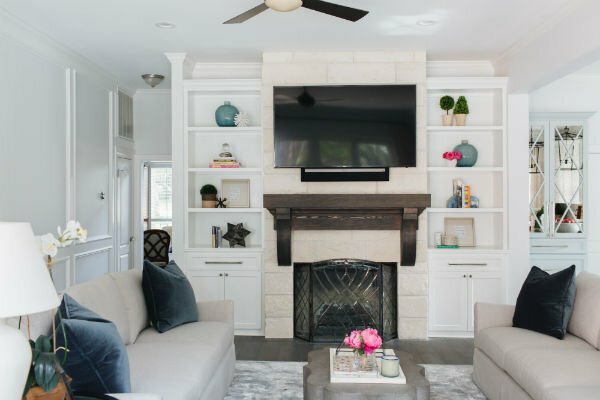 Our Barton Creek Remodel project continues this week into the family room! The home had a pretty classic layout, but the rooms lacked that fresh and spacious appeal of an open layout. 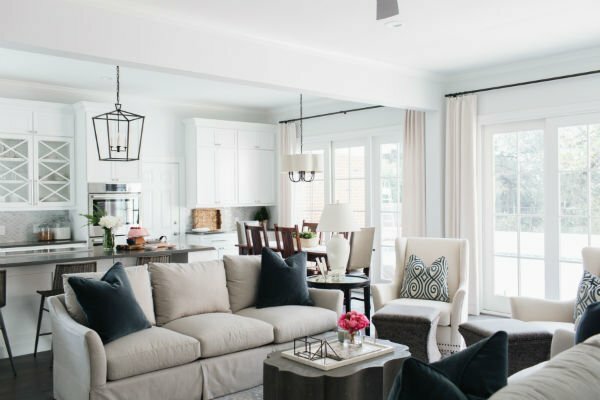 We first toured the kitchen, then the breakfast room, and the last space in this ‘Before & After’ series is the family room. To give you a better understanding of the project, we have included some before photos of the layout. 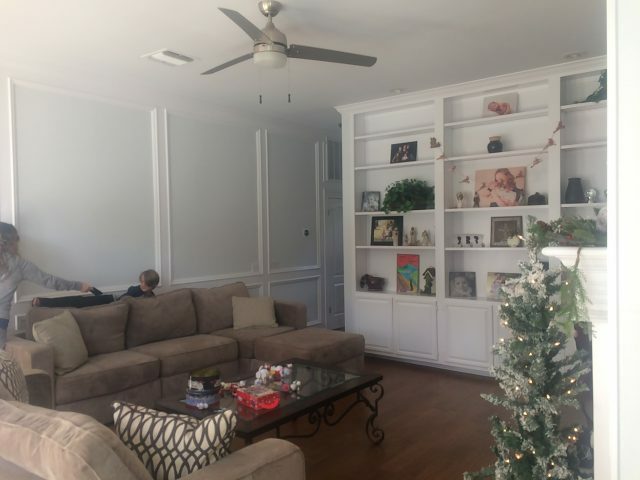 The remodel for this project required knocking down a wall that divided the kitchen and family room. The wall that was removed housed the family room fireplace and mantle. Here is a view of the windows, doors, and existing furniture in the space. Knocking down the wall in between the kitchen and family room required, the large built-in to be reconfigured to fit the new fireplace, mantel and TV. This was a great solution, as another goal of the remodel was to reduce wasted display space for an overall cleaner look. The new layout, furnishings and decor breathe new life into the space. 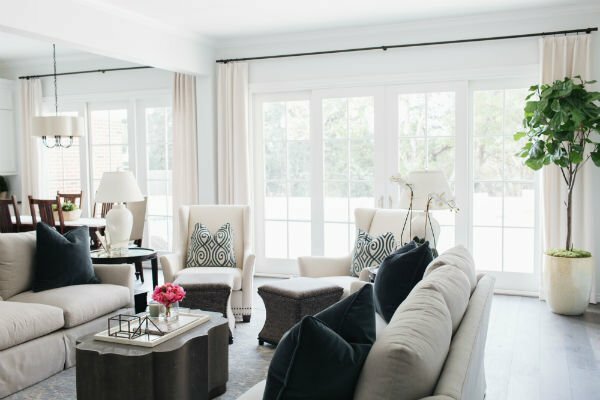 Without a dividing wall between the two spaces, we were able to accommodate more stylish seating in the family room. A pair of sofas and chairs gives the young family plenty of comfortable space to sit and relax. The skirted sofas are upholstered in a durable, family-friendly Sunbrella fabric. Dark blue velvet pillows add a sophisticated contrast against the neutral Sunbrella fabric. 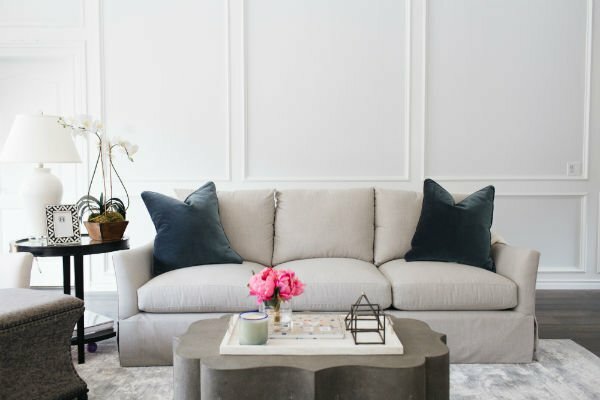 A faux shagreen cocktail table in a unique shape adds a fun element to the tailored space. 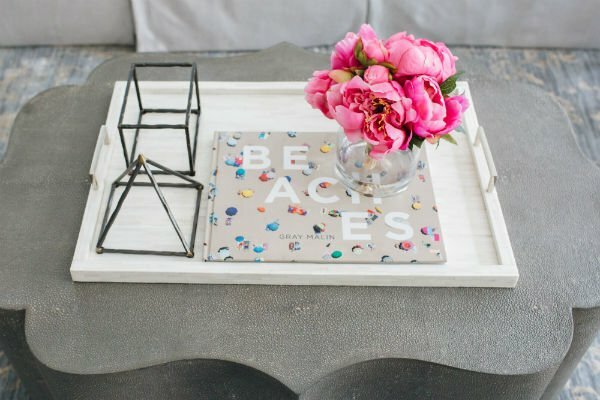 The textured charcoal finish of the table is forgiving and easy to clean and maintain. The chairs are also upholstered in a Sunbrella fabric. The velvet cut pillows add visual interest, color and texture against the crisp new windows and doors. 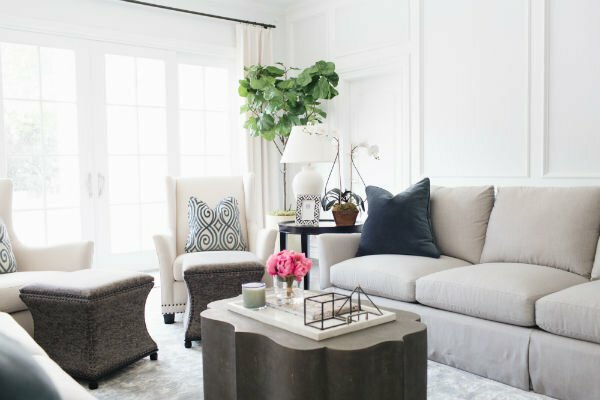 An ottoman in front of each chair gives the homeowners even more versatile seating! An added bonus is that they also provide extra storage inside for toys, blankets, etc. 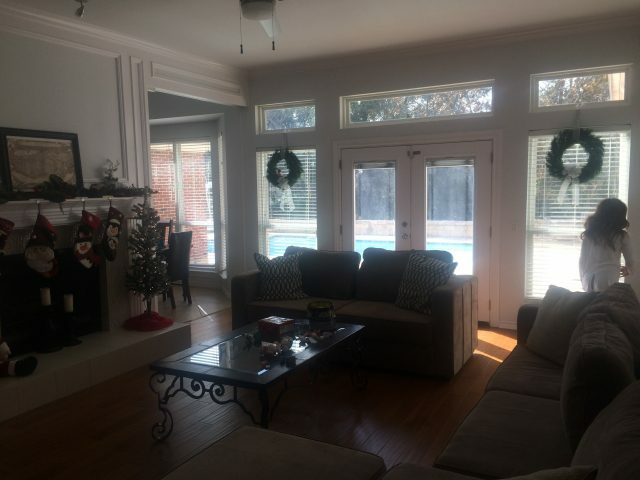 If you noticed in the ‘before’ images, the home used to have skinny windows above the doors and windows. The new sliding doors make such a difference. They also add to the more open, airy feel of the space. Now the entire wall of the breakfast room and living room coordinate for a much cleaner, seamless look. Here’s another view of the shagreen cocktail table with a large bone inlay tray and fun accessories. The fireplace is framed by a smaller set of built-ins. The stone stack fireplace with a dark cocoa mantel adds some warmth to the space. 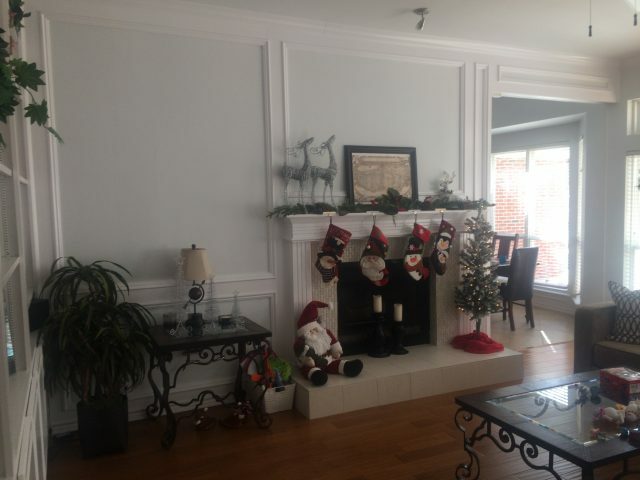 Adding the TV above the mantel allowed the existing paneling on the walls to remain classic and pretty. 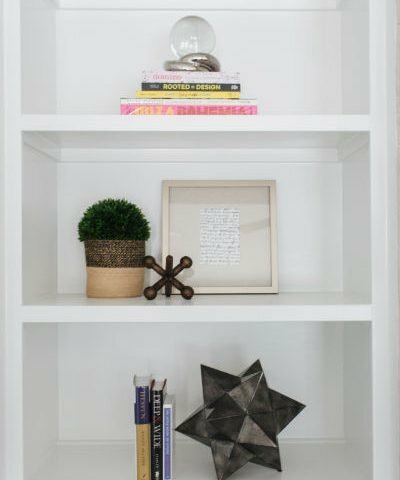 A large built-in with a lot of shelving can be a daunting element as you have to style it and fill it with accessories! We took the 15 long shelves in the old built-in and dwindled them down to 8 matching shelves to flank the new fireplace. These smaller shelves are much easier to accessorize! Minimal accessories can keep a built-in from looking too cluttered. Playing with colors, heights and textures adds just the right pop to this classic space. 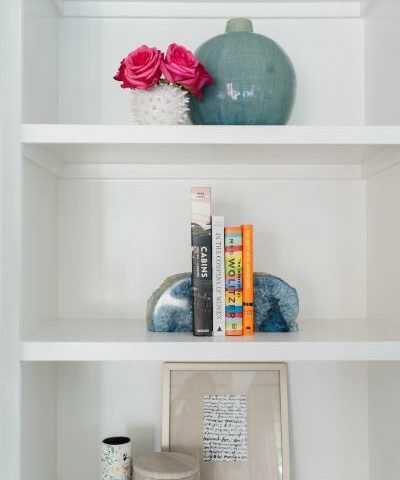 The homeowners can layer in more books and personal mementos over time or keep the shelves just as minimal as we left them. The new stylish furnishings are now the perfect accent against the elegant paneling. 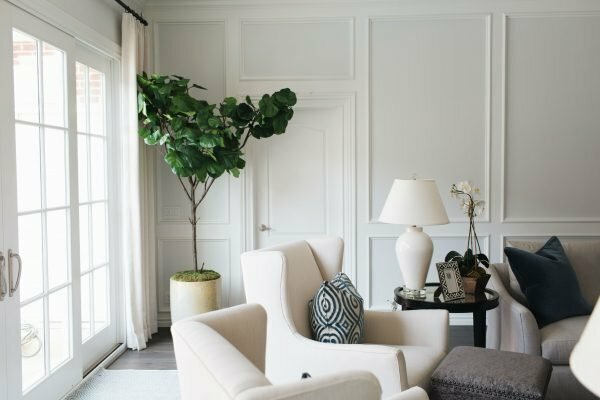 A large fiddle leaf adds a sculptural element to the space. If you have a space that you want to update, let our team help. Fill out our questionnaire, share your project goals, and you will be one step closer to a home that fits your needs and feels like you. As a reminder, we will be closed Wednesday for the Fourth of July. We will reopen Thursday at 11 am!